An accountancy corporation wishing to practice accountancy in California is required to be approved for licensure by the California Board of Accountancy (CBA) before practicing or holding out to the public as an accountancy corporation. It is suggested that you print out the Check Sheet, included in the application packet, to assist you in completing the application process. All forms related to the application process are available on the Licensees webpage. If you have any questions after reviewing the information provided here, you may contact the CBA's Initial Licensing Unit by telephone at (916) 561-4301 or by email at firminfo@cba.ca.gov. Articles of Incorporation must be submitted with the application. The articles must indicate incorporation as a professional accountancy corporation, not a general corporation. 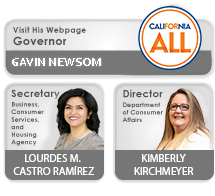 The articles must be endorsed and approved by the California Secretary of State. Additionally, the name on the Articles of Incorporation must match the name on the application submitted for licensure as an accountancy corporation, as well as on all documentation submitted. Information on filing the Articles of Incorporation is available on the California Secretary of State's website at www.sos.ca.gov. A business incorporating in California is subject to California corporation franchise tax requirements. Information regarding franchise tax requirements can be obtained from the California Franchise Tax Board's website at www.ftb.ca.gov. A firm's corporate bylaws must contain an appropriate passage or legend which refers to the restrictions set forth in California Code of Regulations (CCR), Title 16, section 75.9 and Corporations Code (CORP) sections 13406 and 13407 regarding ownership and transfer of share certificates. The name of the firm must meet the requirements set forth in BPC section 5060 and CCR, Title 16, section 75.5. CBA staff is unable to provide guidance regarding firm structure and whether a firm name will be considered false or misleading by your clients, therefore, licensees are encouraged to contact their legal counsel for guidance. An accountancy corporation must renew its license every two years to retain practice rights. The expiration date is based on the month and year the application was originally approved. If approved in an even-numbered year, the license will expire each even-numbered year on the last day of the month in which it was originally approved. If approved in an odd-numbered year, the license will expire each odd-numbered year on the last day of the month in which it was originally approved. The CBA mails renewal forms with instructions approximately two months before the firm's license expiration date. If your renewal form is not completed, mailed, and postmarked by the license expiration date, your firm's practice rights cease until all deficiencies are corrected and the license is renewed. Failure to renew within five years of expiration will result in cancellation of a corporation's license. A cancelled license cannot be renewed, reinstated, or restored. If a corporation's license has been cancelled, the shareholder(s) must reapply and be approved for licensure before practicing or holding out to the public as an accountancy corporation. To dissolve a corporation you must contact the California Secretary of State's office, and file a Certificate of Election to Wind Up and Dissolve with a Certificate of Dissolution. Information about dissolving a corporation is available on the California Secretary of State's website at www.sos.ca.gov. Upon completion of the above, submit a letter to the CBA stating the firm has dissolved and provide the effective date. Upon receipt of the letter, the firm's license will be canceled. The application and initial license fees are $270. Your check, money order, or cashier's check must accompany your application and be made payable to the California Board of Accountancy. Each time your corporation has a change in shareholders or address, you must notify the CBA within 30 days. The notification must be provided in writing and signed. An Accountancy Corporation Name Change must be submitted each time your corporation has a name change. Prior approval is required before you can hold out or practice under an amended name style. The name change application fee is $150. A check, money order, or cashier's check must accompany the application and be made payable to the California Board of Accountancy. The Accountancy Corporation Name Change, including a Check Sheet, is available on the Licensees webpage. Corporations requesting a name change will be required to provide a copy of the amended Articles of Incorporation which have been endorsed and approved by the California Secretary of State. If the non-licensee is a shareholder, the non-licensee must materially participate in the business of the firm. Non-licensees must comprise a minority of owners. The only exception is that a firm with two shareholders may have one shareholder who is a non-licensee. At initial licensure and at license renewal, CCR, Title 16, section 51 requires firms with non-licensee owners to certify that any non-licensee owner with his or her principal place of business in California has been informed of the rules of professional conduct applicable to accountancy firms. A declaration is required to be signed by a licensed shareholder of the firm upon application for firm registration. BPC section 5154 requires CPA/PA shareholders to hold a valid license to practice public accountancy. An out-of-state CPA shareholder or employee of an accountancy firm wanting to practice in California must file an application for licensure, meet the requirements set forth in BPC sections 5087 and 5088, as well as CCR, Title 16, section 21 prior to practicing in California. All forms related to the initial individual licensure application are available on the Licensees webpage. CCR, Title 16, section 75.8 requires an accountancy corporation to provide and maintain adequate security for claims against it by its clients arising out of the rendering of, or failure to render, professional services. Security for such claims must consist of either maintaining insurance in the amount specified in section 75.8(a)(1), or by agreeing to jointly and severally guarantee payment by the corporation of its liabilities to its clients, as specified in section 75.8(a)(2). CPA/PA shareholder(s) and non-licensee shareholder(s) must select and complete one of the declarations for Shareholder Security for Claims against a Corporation Agreement, included in the Application for Licensure packet, by selecting the appropriate alternative. An accountancy corporation must have at least one shareholder with an active California CPA/PA license to obtain a Certificate of Registration from the CBA. Pursuant to BPC section 5154, except as provided for in BPC section 5079 and in CORP section 13403, each director, shareholder, and officer must hold a valid license to practice public accountancy. The director of an accountancy firm must be a licensed shareholder. A corporation also may have a non-licensee shareholder, vice-president, or secretary (officer). However, a non-licensee may not be both a shareholder and an officer. A non-licensee cannot be a director of the firm.